One of my favorite pastimes is traveling with my dog, Dexter. Dexter and I love dog-friendly weekend trips. Dexter and I were invited to speak about cats at Anderson Animal Shelter’s Pets-a-Palooza Pet Festival, so we made a weekend trip out of it. Once again, we took our good friends Levi and Chris. It’s always more fun to travel with friends. When I was looking for a dog-friendly hotel in the Chicago area, I found Extended Stay America – Chicago – Lombard – Oak Brook. The hotel is located at 2701 Technology Dr., Lombard, IL, which is about 30 minutes from Chicago. After reading some reviews, I decided the hotel sounded like it would be a clean, friendly, and safe hotel to call home for the weekend. Dexter and I have stayed at various Extended Stay Americas over the years, and we have always been very happy. One of the best attributes for us is that all the Extended Stay Americas are designed for longer stays (and are great for shorter stays too) and include a lot of great perks. The rooms are spacious and feature an amazing kitchen area with a full refrigerator/freezer, microwave, stovetop, and dining and cooking utensils. Because Dexter eats fresh food, this is so important to me. I really appreciate the kitchen space. 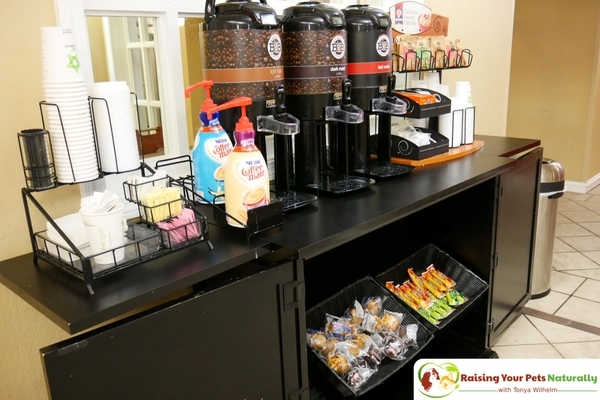 The Extended Stay America – Chicago – Lombard – Oak Brook offers free Wi-Fi, flat-screen TVs, iron and ironing board, on-site guest laundry, grab-and-go breakfast, large in-room work space, and updated bathrooms. While checking in, I was offered full-service cleaning, but I declined this service since I prefer not to have housecleaning in my room when I’m traveling with Dexter. We booked the studio suite with 2 queen beds. Our Extended Stay America room was amazing and perfect for our weekend trip. We had lots of great foot space, chairs, large closet space, lots of dresser drawers, and a great eating bar. The room was clean and fresh, including the bathroom and the kitchen area. The beds and pillows were comfortable and clean, including the mattresses. It’s all about the doggie potty breaks for Dexter. Our Extended Stay America had a lot of great walking areas and green space for Dexter to relieve himself outdoors. Hotel safety is so important to me, since I tend to travel alone and Dexter needs frequent potty breaks through the day and night. During the evenings, I prefer to stay in well-lit areas, close to the hotel entrances, and the hotel had plenty of walking and green space right up front on both sides of the entrance. I felt perfectly safe walking Dexter there at night. During the day, I was able to walk the hotel grounds with Dexter and even around the pond adjacent to the hotel. I had zero concerns walking Dexter around any part of the hotel, which was very comforting. Lots of safe green areas to walk. Once again, our stay at Extended Stay America was a wonderful experience. 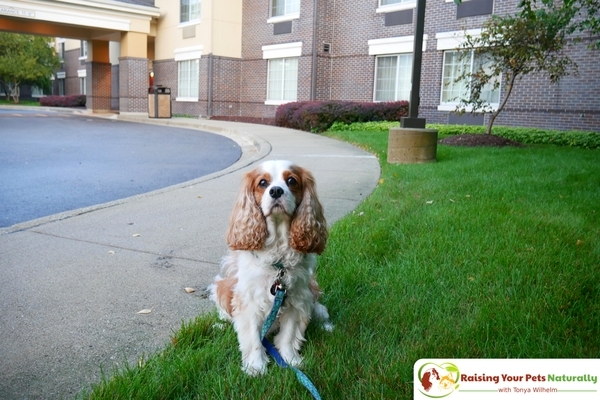 This dog-friendly hotel was well-maintained, safe, and in a perfect location for our adventures. The hotel staff was extremely friendly and always asked how we were when we came in and out, and checked if we needed anything. The TV and Wi-Fi had great reception, the bedding and linens were clean, and the bathroom was stocked. The hotel met my five criteria of being safe and clean, in a good location, with refrigerator and friendly staff. I would certainly stay at the Extended Stay America in Chicago – Lombard – Oak Brook. again. 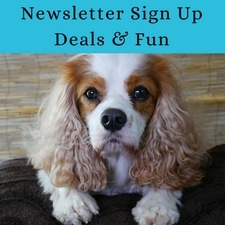 For more information on finding a dog-friendly Extended Stay America on your next vacation, visit their website. Great review, and I LOVE the video walk through! 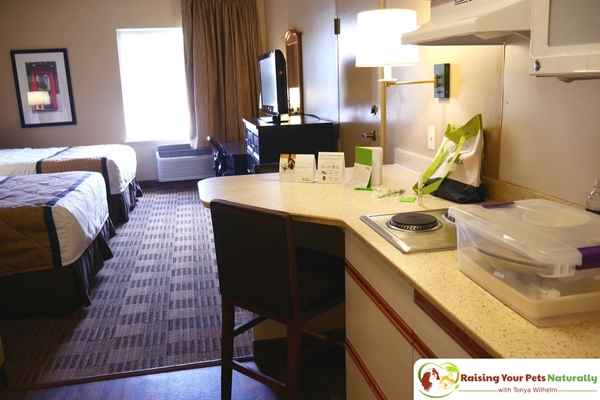 Recently Wynston and I stayed at Candlewood Suites in El Paso, TX and we LOVED IT! It was super dog friendly. Next week we’re staying at Staybridge Suites in Dallas, TX for 7 days and I can’t wait. My favorite part is definitely the full kitchen. Nice to know the Extended Stay offers a good setup! Thanks, Amanda! Wynston sounds like a lucky boy. It’s so fun traveling with our pets. Yes, the Extended Stay Americas are a great dog-friendly hotel. What a great review. We did not get a dog due to the trouble with going away I had no idea that there were such dog friendly places – or that there was so much to think about. I think it is great that they have put so much thought into this place. Am glad you found somewhere so suitable. This is awesome! I would love to travel more but with the pups I’m always afraid of not finding the right place or annoying friends/family by bringing them. The option of using pet friendly hotels is a great idea! I will definitely have to check and see if they have any near our next travel destination! Fantastic! Extended Stay Americas are wide-spread. Don’t forget the promo discount code below (I’ll try to keep it updated) when you book. Finding a good hotel is always a must for me too when traveling. Glad this place was Dexter approved! 🙂 Thanks, Tara. Yes, big refrigerator and lots of green space meet Dexter’s approval. This is such a great idea for a blog post! I love to know where I can and can’t take my dogs! Im sure people in the Chicago area will be super grateful for such useful info! Thanks for sharing fab Blog! Thanks, Jade. As someone who travels with her dog, it can be hard to find a safe and clean dog-friendly hotel. 🙂 I love sharing good ones! This is so good to know. Often I see pet friendly hotels, but it’s only for very small dogs. I wish I could find more for larger dogs. I know, right? I used to have a large breed dog, they don’t make any more mess than a smaller dog! I love that more and more places are pet friendly. It makes traveling easy. I just recently got a puppy and I love to travel frequently. 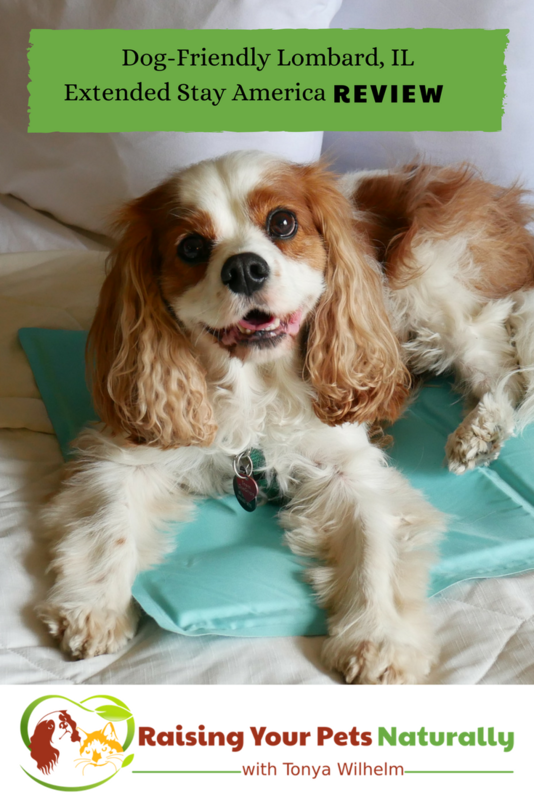 I know that I will want to be able to bring my dog with me when I travel so finding pet-friendly hotels is something I need to start learning about. The Extended Stay America looks like an amazing place to stay with your pet and I will be keeping them in mind. That’s awesome! I love traveling with Dexter. We have the best of times. This sounds so cool! This is good news for a lot of pet lovers who loves travelling. It looks like a nice hotel to relax and spend the days with pets. Thanks, Sharon. 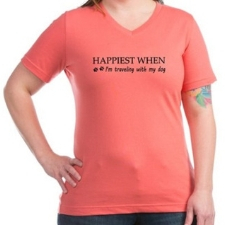 Yes, super fantastic when traveling with pets. I have traveled with my dogs quite a bit. 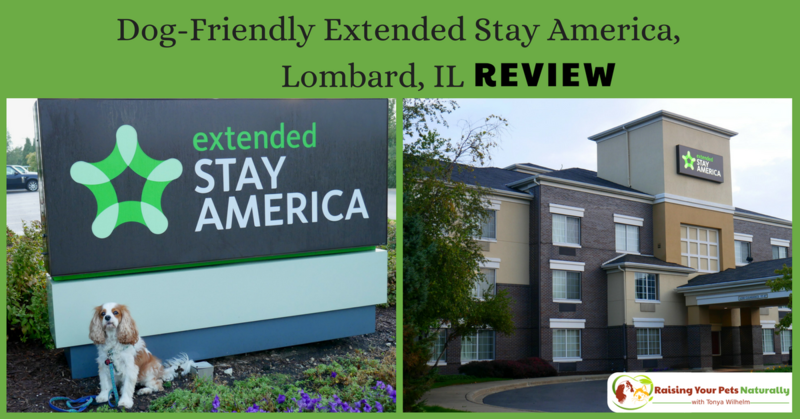 The Extended Stay in Lombard sounds like a great option for pet families! Thanks, Heather. Awesome. Yes, check them out when you are booking your next trip. I have been hearing about these pet hotels of late. I couldn’t afford it at all but I understand people need to have places to care for their furbabies when they just have to be away. I am always apprehensive to travel because of my pets. This is super helpful. Glad to help. If your pets are social, traveling can be so much fun. This is good info, thank you. I’ve been saying I’m going to Chicago for a dog-friendly adventure for a while but haven’t got there yet. When I travel in the US, I stay at the Red Roof a lot and have had good luck there too. Room cleaning, however, is one of my favourite things about travel and miss it when I get home. Oh, you should check out Chi-town. You would have a blast. Unfortunately, I’ve had horrible experiences with Red Roofs (many, many times). Glad your experience was better. We were just in Chicago and its always good to know about pet friendly hotels. Especially since we want to get a dog soon! We love Extended Stay hotels!! I love that they are so pet-friendly it can be hard to find hotels that are so accommodating. Ya! Me too. It really can be a challenge to find a dog-friendly hotel that is nice and not scary. Our Extended Stay America stays have always been great. This looks like a great place to stay! I have not traveled with my dog before, but would love to find a place like this if I do in the future. Also – Dexter is so cute (and photogenic!). Thanks, Trish. If your dog is social, you should give it a try. It’s so much fun. Dex, said thanks! Thanks. That would be so much fun. 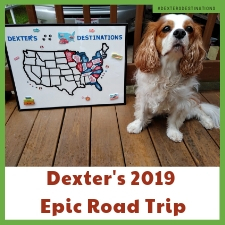 We, ok, I, so what to head West with Dexter! What a great post! Hotels that are pet friendly AND have green spaces nearby are the best. Time to visit Chicago?? Haha Yes. It’s a great city. We had so much fun. It can be hard to figure out where to visit when you are traveling with a pet. This list is sure to help so many people find accommodation. Thanks. Glad you enjoyed my review of the Extended Stay America. It’s so nice to know that Extended Stay America has dog friendly options! Great review, and wonderful video, it really shows what the room looks like. This will be so helpful to people looking for a dog friendly extended stay hotel. We travel so much with our dogs, we haven’t tried Ent. Stay yet but will keep it in mind for sure. Thanks, Cathy. I can honestly recommend the ESA chain with confidence. I so love the big rooms and amenities. Thanks, Shelby. We had a great time. Oh wow thank you for making this guide on dog friendly hotels in Chi-town! It makes searching and book so much easier. Btw Dextor is so adorable! Aww, thanks. We love staying at the Extended Stay Americas, so far every stay has been great. 🙂 Chi-town was amazing! I love that there are some pet friendly hotels all over the place. I haven’t been to Chicago but I hear it’s a great place to visit. I love knowing there are pet friendly hotels so that I could bring along the doggies! Thanks, Brandy. We had such a great weekend in Chicago. Definitely on the do-over list. Great review – a particularly liked your mention of the safety of the hotel and surrounding area as well as the outdoor lighting. Taking my dog out after dark in an unfamiliar place often makes me nervous. It’s obvious that a lot of thought went into the design of the hotel’s grounds, which I really appreciate. Thanks, Lori. Yes, so thoughtful for having lots of grass next to the building and lit up. I love this! We just got a new puppy and we’re trying to bring him everywhere, so it’s always nice to know where pet friendly places are. Ya! Congratulations on your new puppy. I don’t think I’ve stayed at an Extended Stay America before. It reminds me of Holiday Inn Express which I love. I’ll have to consider this hotel next time. I’m always up for trying new places. Bonus for being pet friendly! Thanks for sharing your review. I appreciate hotels with refrigerators as Mr. N’s food needs to be refrigerated too. He can be picky about shelf-stable foods so it’s always a puzzle. Everything looks very convenient! Yes, it’s so important for us real feeders! You guys would love it. I’ve never stayed in an Extended Stay America but it looks amazing. I love that they are so dog friendly! Thanks, Heather. Yes, a great chain!! I had a Pomeranian for years that I traveled with. Finding nice pet friendly hotels was always tough. Pomerainians are adorable! Yes, so glad to have found the Extended Stay America chains. I love the ides of pet friendly hotels. 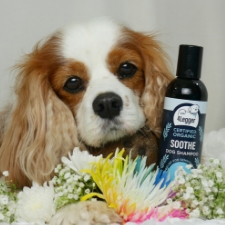 It means dog and cat people can go travelling and relax knowing they will be made so welcome! 🙂 Nice dog-friendly and pet-friendly hotels are so important! You make some helpful points about Exteneded Stay America’s amenities, especially the refrigerator for fresh food (for pups and humans)! While we haven’t traveled overnight with the pups, we have some weekend trips in mind. Thanks. Weekend trips are the best! I am so glad to see more and more hotels becoming pet friendly. It makes it so much easier to travel with them now. I know. I love traveling with Dexter. It’s a shame when there isn’t a dog-friendly hotel in a city we want to visit, we have to choose another city. Seems like a great place to stay! I will keep them in mind when I make my travel plans next spring! Sounds like a great pet friendly hotel in Chicago. I like the Extended Stay with all those benefits. 🙂 Yes, had everything we needed and wanted. This is a great list. I love traveling with our dog and it is good to know where to stay. Chicago is a fun place! Thanks. Yes, Extended Stay America is a great place to stay when visiting Chicago. I loved reading this post! Hotels welcoming pets are a big plus and makes our lives so much easier. Bonus to those which have no breed restrictions or huge pet fees. So glad to see their thoughtfulness in providing potty break areas. Thanks! Yes, loved all the grass in lit areas. I’ve never stayed at an Extended Stay America before, but it looks like a hotel chain I’d be interested in staying. The girls don’t travel with me yet, but I do like to be comfortable when staying away from home. Yes, lots of comfort and space. We weren’t bumping into each other and had plenty of space for all of our stuff. I am so sorry for your loss. Luckily, the Extended Stay Americas have quite a fee locations. Looks like a great place! I agree a kitchen space or at least a fridge is so important. Not all pet friendly hotels have a fridge, which definitely makes food problematic. 🙂 We really have had great experiences with the Extended Stay America Chains. It’s one of our go-to hotels. Great review! I have always been happy with Extended Stays and most have been accommodating with our giant dogs which isn’t always the case with some hotels. I especially liked that you touched on feeding fresh food and how that impacts which hotel you stay at. We raw feed and with two giant dogs, that is no small task. Having ample kitchen space and large enough refrigerator is very important for us. I will be more encouraged to stay at an Extended Stay after reading this review. Thank you! Ya! Yes, that refrigerator is so important to us. The kitchen for all the food prep, amazing! Thanks for the recommendation – we’re always travelling places we can drive with the pack. Would like to visit Chicago one of these days. It’s too far to do a return trip in one day so we would definitely need to book somewhere for at least one night! Sure thing. It’s a great time! 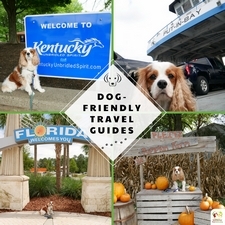 Thank you so much for this post, I always love finding dog friendly hotels! I might have missed it but do they charge extra for dogs? Sure thing. Yes, they do have a pet fee, but because they also specialize in long-term stays, they max it out, then drop it down for longer stays. 🙂 A $25 (+ tax) per day, per pet non-refundable cleaning fee for the first month (not to exceed $150 + tax per pet), payable the first night of your stay and is charged at check-in. Each month thereafter is a $10 non-refundable fee (+tax) per day for the first 5 days of each month (not to exceed $50 + tax per month, per pet). Thanks, Robin. Dexter tries to put on his best face. 🙂 Yes, the kitchen is amazing. Glad to hear you had a wonderful stay. In Europe there are plenty of hotels that allow pets.